Don’t be misled by crappy schematics…with low values like 100 µF. You want to use at least 1000 µF [between the LM386's output and the speaker] to guarantee good bass with a wide variety of speakers. However, in the circuit that I made following this video's instructions, replacing a 1000 µF cap with one of lower value resulted in no difference in sound quality which was audible to me. 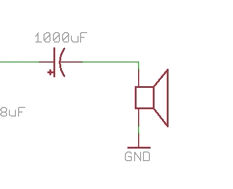 Is the assertion that a capacitor of 1000 µF or higher is necessary true? If so, and if the reason is that given in the video of allowing for "good" bass, how does such a capacitance allow for that? If this is not the reason (or the only reason), what is another? 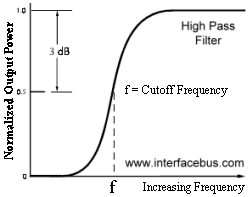 The capacitor referred in the video forms a high pass filter with the speaker (C-R filter). Using this calculator you can see that a 4 ohm speaker and 1000uF give a "cut-off" frequency at about 40Hz. 100uF would give a "cut-off" frequency at about 400Hz. Whether it is audible or not it depends on the music you are listening to and your speaker system, etc. Adding to Wesleys's great answer. It also depends on the size of the speaker. If it's little 2 or 3 inch speaker, it's bass output will already be severely attenuated so if you use a smaller capacitor you probably wont be able to tell and difference. If you use a 12+ inch woofer, you will notice it more. By the way, the reason you need one at all is because speakers do not like DC voltages. DC will force the coil out of the magnet, or at least to their limiting point and can damage them. To add to the above, it's also about the output power levels. The sensitivity of human hearing falls off rapidly below about 100 Hz. An efficient speaker will certainly "fill a room with sound" for 1W of power spread over a frequency range like 100Hz to 5KHz (as stated in the video) which covers most of the sound energy for speech and music, but as the plot below shows, 1W at 20 Hz would be virtually inaudible compared with 1W at 100 Hz. In fact many audio recordings filter out any audio frequencies below about 40Hz, simply because relatively low-powered "consumer grade" audio systems won't reproduce them anyway, and it is more effective (i.e. louder!) to have more sound energy at higher frequencies. Note that "subwoofers" for home cinema installation etc are designed to create a lot of noise efficiently, but they are usually very poor at reproducing low frequency audio accurately, as required for hi-fi-music - but nobody knows what an "accurate" reproduction of an explosion sounds like anyway, so this doesn't matter much! Of course the average power level from an instrument like a bass drum is quite low, since most of the time it is actually silent, but the peaks are high - and the speaker system has to be able to handle those peaks. The frequency response of "cheap" headphones or earbuds is usually much wider than a small speaker - but 1W is too much power to drive headphones without damaging your hearing, so the amplifier design is the wrong choice. All the frequency response stuff is correct .I would use 1000 microfarad cap even if the speaker is a poor quality small magnet type .There are reasons .Electro caps dont last for ever ,in fact they can degrade over time giving reduced capacitance so it is better to build some margian by using a big cap.On a less obvious note it keeps the impedance more constant around the bass cut frequency .When I was building an active crossover system for an old college mate I was given an off the shelf stereo amp to do the tweeters with .The amp had 1000 microfarad output caps which was why it was not used for bass .I used conventional low noise JFET opamps to do the crossover function.I experimented with a metal film cap in the output stage which was sized well below the crossover cut frequency .I tested the amp on the sig gen monitoring the output into my 8 ohm dummy load on an analog scope .Distortion was noted around the cut frequency well below the normal clipping point .Increasing the cap value to 470 microfarad which was on hand made this distortion disappear . Not the answer you're looking for? Browse other questions tagged audio electrolytic-capacitor lm386 or ask your own question. What kind of speaker can be used with an LM386?